Anti-reflux surgery is a treatment for acid reflux, also known as GERD (gastroesophageal reflux disease). GERD is a condition in which food or stomach acid comes back up from your stomach into the esophagus. The esophagus is the tube from your mouth to the stomach. Reflux often occurs if the muscles where the esophagus meets the stomach do not close tightly enough. A hiatal hernia can make GERD symptoms worse. It occurs when the stomach bulges through this opening into your chest. You may want to consider surgery if acid reflux is diminishing your quality of life. ‣ Your symptoms do not respond to lifestyle changes or medications. ‣ You continually require medications to control your symptoms and do not want lifelong medication use. ‣ You can’t tolerate medications that treat acid reflux due to their side effects. ‣ You are experiencing complications from acid reflux, such as bleeding or scarring of your esophagus. 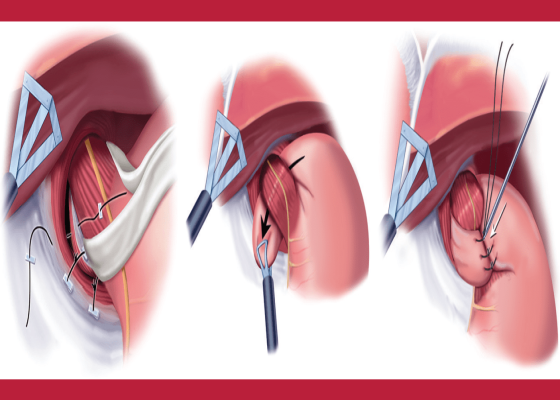 • Your surgeon will make 1 large surgical cut in your belly. • A tube may be inserted into your stomach through the abdomen to keep the stomach wall in place. This tube will be taken out in about a week. • Your surgeon will make 3 to 5 small cuts in your belly. A thin tube with a tiny camera on the end is inserted through one of these cuts. • Surgical tools are inserted through the other cuts. The laparoscope is connected to a video monitor in the operating room. • Your surgeon does the repair while viewing the inside of your belly on the monitor. • The surgeon may need to switch to an open procedure in case of problems. • This is a new procedure that can be done without making cuts. A special camera on a flexible tool (endoscope) is passed down through your mouth and into your esophagus. • Using this tool, the doctor will put small clips in place at the point where the esophagus meets the stomach. These clips help prevent food or stomach acid from backing up. The liver is the body's largest internal organ (approximately 3 pounds in adults). It is located below the diaphragm on the right side of the abdomen. • Produces most proteins needed by the body. • Metabolizes (breaks down) nutrients from food to produce energy, when needed. • Prevents shortages of nutrients by storing certain vitamins, minerals, and sugar. • Produces bile, a compound needed to digest fat and to absorb vitamins A, D, E, and K.
• Produces most of the substances that regulate blood clotting. • Helps your body fight infection by removing bacteria from the blood. • Removes potentially toxic byproducts of certain medications. ‣ Sclerosing cholangitis (scarring and narrowing of the bile ducts inside and outside of the liver). This causes backup of bile in the liver and liver failure. ‣ Biliary atresia (malformation of the bile ducts). This is a common reason for liver transplant in children. Surgery is done while you are under general anesthesia, so you are asleep and pain-free. Liver transplants usually take from six to 12 hours. During the operation, surgeons will remove your liver and replace it with the donor liver. • A nasogastric tube will be inserted through your nose into your stomach to drain secretions from your stomach. It will remain in place for a few days until your bowel function returns to normal. • A tube called a catheter will be placed in your bladder to drain urine. This will be removed a few days after the operation. • Tubes will be placed in your abdomen to drain blood and fluid from around the liver. These will remain in place for about a week. • Rejection : our immune system works to destroy foreign substances that invade your body. The immune system, however, cannot tell the difference between your transplanted liver and unwanted invaders, such as viruses and bacteria, so it attempts to attack and destroy your new liver. This is called a rejection episode. About 30% of all liver transplant patients have some degree of organ rejection in the first year. Patients take anti-rejection medications to ward off the immune system attack. • Infection : Because anti-rejection drugs suppress the immune system, liver transplant patients are at increased risk for infections. This problem lessens over time. Not all patients have problems with infections, and most infections can be treated successfully as they occur. The average hospital stay after liver transplantation is 10 to 14 days. Some patients may be discharged in less than one week, while others may be in the hospital much longer, depending on complications that may arise. You need to be prepared for both possibilities. Readmission to the hospital after discharge is not uncommon, especially within the first year after transplantation. The admission is usually for treatment of a rejection episode, infection, or other complication.